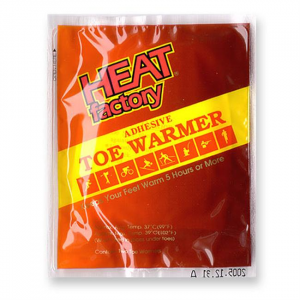 Heat Factory's Toe Warmers are designed to activate in a restricted air environment like your shoe or ski boot. The half-moon shape of these soft pouches has a thin adhesive layer that holds it under your toes outside of your socks. Banish cold feet forever. This pair of insoles is designed to heat up in the restricted air environment of a shoe or boot for up to 6 hrs. When placed under socks, the thin, comfortable insoles provide soothing warmth. Popular-size Mini Warmers provide warmth for 10+ hrs. and are ideal for gloves, pockets, Heat Factory headwear or any place where soothing heat is desired.